speeding into the 1950s. The company helped to 'rock' the decade by introducing platform rockers in addition to its increasingly popular reclining chairs. Next came the built-in ottoman and then the automatic footrest - or Otto-Matic as La-Z-Boy cleverly called it. Jerry Lee Lewis encouraged people to "Shake, Rattle & Roll," and they did with the La-Z-Boy Tranquillator - an optional vibrating feature that could be added to any recliner for only $10. Innovation was everywhere - from 3-D movies to hula-hoops. La-Z-Boy joined in the fun in 1959 with its own off-the-wall idea. Created as an auction piece, it was the loveseat to top all loveseats - upholstered in mink and designed to look like a car seat, complete with horns, radio, lights and blinkers. and a blonde bombshell named Marilyn Monroe. Father knew best and the Crosby family presented the perfect picture of the American home with Bing relaxing in his La-Z-Boy recliner. In the mid-'50s, La-Z-Boy appealed to both sexes with the Hi-Lo Matic. This innovative design featured an adjustable back that could be raised to accommodate a man's comfort needs and lowered to appeal to the aesthetic desires of the woman of the house. By the 1960s, La-Z-Boy had completely changed its focus. Long known as a man's chair, La-Z-Boy supported equal opportunity by advertising the recliner as "The Most Comfortable Part of HER Day." 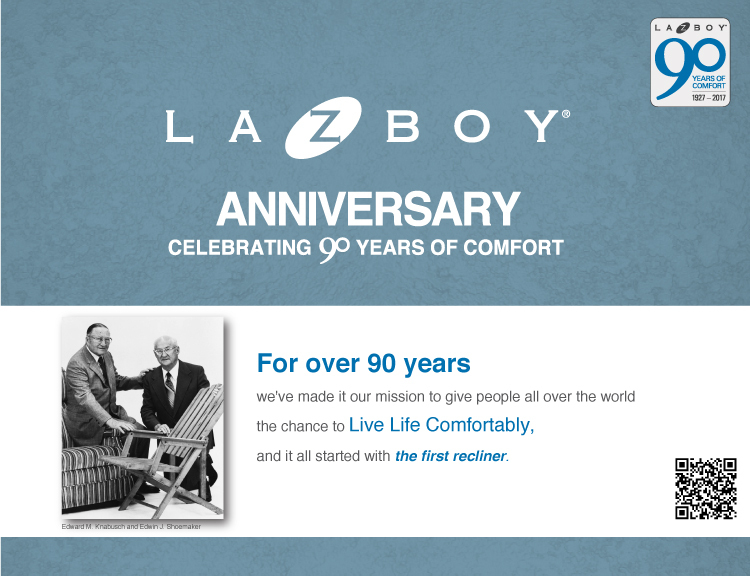 The '60s also brought freedom, peace and love, and La-Z-Boy did its part to bring people closer together with its Sofetteจ, a dual-reclining loveseat.